Twitter has been on a roll with new product and feature announcements lately: first came the new version of embedded tweets, which brings any extra content such as photos or video into the embedded message, and now the company has launched a new app for creating and sharing short video clips called Vine, not to mention the recent launch of Instagram-style photo filters and editing. Are these features that will enhance the Twitter experience for users, or are they signs that the service — which many saw as the poster child for simplicity of design and usability — is in danger of losing its way? The defining feature of Twitter used to be the brevity of its messages: 140 characters and no more. Debates periodically flared up about whether this would ever be increased, but Twitter made it clear that it had no intention of expanding the nature of a tweet — until it decided to do so itself, of course. Expanded tweets or “Twitter cards” were launched in stages, first with a redesign of the company’s website and then with the mobile apps, all of which allowed additional content from certain partners (photos, video, music links, etc.) to appear inside a frame within Twitter. Six-second video clips — the essence of simplicity? Now users can download the Vine application for iOS, which was developed by a company that Twitter recently acquired for an undisclosed sum, and create short video clips (no more than six seconds) that they can share on the network, which will show the entire clip inside an expanded tweet. Although they use video, the effect is similar to that created by Cinemagram, a service that lets users create small animated GIF images from photos, as well as Viddy or YouTube’s new Capture app. 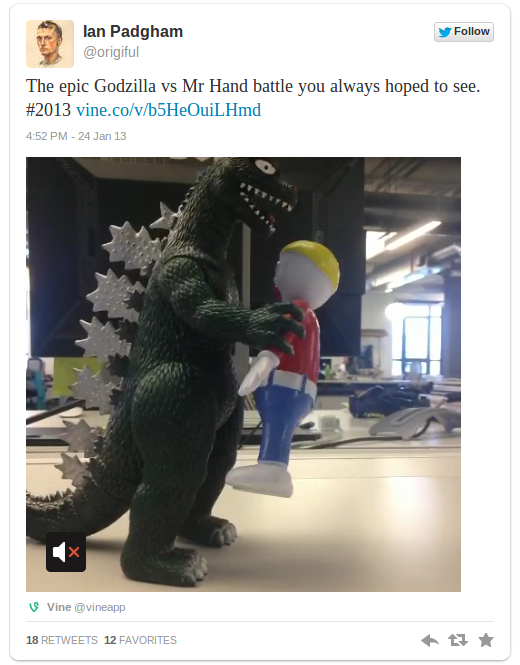 To others, however, having tiny video clips auto-play inside your Twitter stream is annoying (the clip that Vine used on its blog announcing the launch was a good example). As my GigaOM colleague Eliza Kern noted in her post on the news, other short video services such as 12seconds have not lasted very long once people grew tired of the novelty. Will Vine be any different? Animated GIFs have become part of the media sphere — with some sites such as Tumblr creating specific GIFs for news events like the presidential debates — but they are still a relatively niche attraction. What is Twitter’s vision of the future? But apart from the ephemeral nature of Vine clips themselves, for me the launch raises questions about what exactly Twitter sees as its unique value proposition in what has become an increasingly crowded media environment. Not so long ago, Jack Dorsey — who is widely admired as the product visionary behind Twitter, although he is no longer the chief product officer there — made it clear that simplicity was one of the core aspects of the service. Does showing movie clips inside a tweet really fit that description? You could argue that it’s better than full-length movies in a tweet, but still. And what about the decision to acquire Vine instead of just partnering with it, or giving it the ability to embed content via expanded tweets? Jason Goldman — who was the former VP of product at Twitter before he left to join Twitter co-founder Evan Williams at Obvious Corp. — said in a tweet that he thought acquiring Vine and leaving it as a standalone entity (in much the same way Facebook did with Instagram) was a stroke of genius for the company, but others aren’t so sure. Perhaps Twitter sees the potential for Vine to be monetized by including product shots for commercial brands inside tweets, something that might help the company generate the kind of revenue it needs to justify its estimated $10-billion market value. That’s a goal that has also led Twitter to shut down partnerships with services like Instagram and Tumblr, which it sees as competitors, and restrict what others can do with Twitter data. But are those good decisions for users, or just for Twitter? In a recent post about Twitter’s ambitions — or potential ambitions — to be a media company, John Battelle of Federated Media wrote about how the service could not only curate but eventually create media, and I argued that if it wants to do this, it is going to have to get a whole lot better at finding and recommending relevant content. Are millions of short video clips going to help it get there? I don’t see how. And adding more and more content to each individual tweet threatens to overwhelm a service that used to be a bastion of simplicity in an ocean of noise. Vine reminds me of those irritating GIF avatars you see all over the internet. I hope it doesn’t turn into something so goofy that my Twitter feed becomes a wasteland of silly six-second cat videos. I think Twitter wanders too much for a 10BN company. While FB can diversify because they give more opps to their gathering community, Twitter is basically info-only service and not community which gathers for hours. Trying to be more and more complex may distract loyal users while not attract others because they already have better services which Twitter tries to mimic. The truth is as foward thinking as this may seem to be, there is only one way this will work and that is through a very fundemental opt-in stream interface. I for example revel in the simplicity of 140 characters and like the ability to dip a toe in my link stream or jump in head first. This is what makes Twitter so great, background noise filtering that works for me but doesnt work for everyone else. Mathew I think its just a supplementary service. the 140 characters are still what defines twitter..
1 step at a time up the content stack for Twitter. And LinkedIn. Facebook. Etc. Own the social data, own the network. Own the network, change discovery. Change discovery, change industries.